Limited Edition Accents Of 24 Karat Gold And Sterling Silver. He is one of country music's true legends, with more than 50 million in records sales. three platinum and ten gold records. But it is the heart of his music that calls to us - for his songs speaks to the journey of his life, and tell the stories that shaped the man. 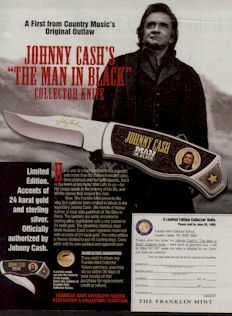 Now, The Franklin Mint presents the very first collector knife created in tribute to the legendary Johnny Cash. The handle of tooled leather, is in set with a portrait of the Man In Black. The bolsters are richly accented in 24 karat gold. The gleaming stainless steel blade features Cash's own signature mark rich with accents of 24 karat gold . The entire edition is forever limited to just 45 casting days. Complete with its own padded and zippered case . Copyright � 2004 All rights reserved.